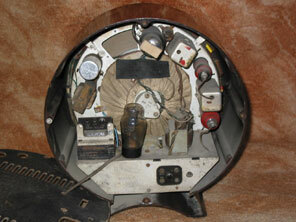 So here is the second of the two "round" Ekco's on this site. It is such a design classic, pretty much every wireless collector owns one (or wants one!) Shown here is the model A22 from 1945. In fact five “Round” sets were made by Ekco, the first appearing some 12 years earlier. Designed by Wells Coates, the first of the five sets is the AD65 of 1934. Next came the AD36 of 1935, and also the AD76 of the same year. These were followed in 1940 by the AD75, notable for being smaller than the previous sets, as attempts were made to preserve raw materials during World War II. Finally the A22 was released after the war in 1945. Since the tuning scale traverses a complete circuit of the front of the cabinet, many people find the A22 the most visually pleasing of the series. The set is a 3 valve plus rectifier superhet, the valve line-up is ECH35, EF39, EBL31, AZ31. The mains transformer, output transformer, tuning capacitor and rectifier valve are mounted on a small chassis at the base of the receiver, thereby concentrating weight at the bottom of the cabinet and reducing the risk of the receiver toppling over. Most of the remainder of the small components (eg resistors and capacitors) are mounted on a flexible band bolted around the rim of the chassis in the redundant space where the tuning light box travels. The remaining valves and IF coils etc are mounted on a vertical chassis directly behind the tuning scale, with the speaker occupying the centre area. The A22 was featured in the “Britain Can Make It” exhibition in 1946 in a one-off green cabinet. This show was designed to demonstrate that even after 6 years of conflict, Britain would be able to repair the damage and build products to the standard achieved before the onset of war. The circuit is in fact that of a fairly standard superhet, and is housed in a cabinet of H 14½”, W 13” D 7 ½”. The tuning scale is printed on translucent perspex that extends entirely around the front of the cabinet. The cursor is a light box that travels around the circumference scale illuminating stations (from the rear) in the vicinity of the station selected, with the actual station “tuned in” being indicated by a central black line. The receiver was available in two versions. The set shown is the brown cabinet with “Florentine bronze” fittings, which sold for £17.17s.0d. 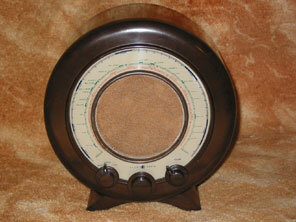 As before the War, the set was also available in a black bakelite with chrome fittings.